USA Canoe/Kayak (www.USACK.org) has announced that the 2008 U.S. Olympic Team Trials for Sprint Canoe/Kayak will take place April 18 – 20, 2008 in Oklahoma City, Okla..
Nearly 100 elite paddlers from across the U.S. are expected to compete in the three-day Trials competition that will determine the ranking of sprint athletes vying for selection to the 2008 U.S. Olympic Team and will select paddlers to represent the U.S. at the 2008 Pan American Championships and Continental Qualification event for the Olympic Games this May in Montreal, Canada. 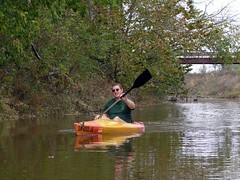 The 2008 Trials, which are to take place on the recently completed Oklahoma River championship course at the state-of-the-art Chesapeake Boathouse, mark the first time that a major national canoe/kayak event will be held in the state of Oklahoma. Only about two weeks away. This should be a great event. Nice kick off to Spring, and a great way to introduce the community to the sport. I agree. OKC voters were real smart to invest in their community by making the river a real asset to downtown. Thanks for stopping by, Moose!